Dennis, thanks for these pics; not a car I am familiar with. Any further information that I can add to the pics? EOG 454 is listed on the Chassis Register - does it survive in this form? (19-07-2018, 12:21 PM)Mike Costigan Wrote: Dennis, thanks for these pics; not a car I am familiar with. Any further information that I can add to the pics? EOG 454 is listed on the Chassis Register - does it survive in this form? It is minus the Supercharged engine of which Stuart has the bottom half at least. It has 16 inch wheels. My father saw it in Westminster hospital car park in a corner where other cars had been abandoned......enquiries traced it to a doctor, David Leslie Harris, and it was purchased for £15 by father for me in Nov 1961 when I was aged 17. Not running so a rather cold and thrilling tow home from Westminster to Loughton (Essex) with father at wheel and me in passenger seat.......the hydraulic breaks did work and we only ran over the towrope once. I did a bit of work on body and some upholstry and 'rebuilt' the engine.....it fired up first time much to my surprise. (see pics of it minus bonet on first road trial outside my parents house! It never made it back onto the road ...my career at sea, a running Nippy, Rileys, etc.........and it is still languishing in my barn in the same state. I don't like doing jobs unless I can do them properly and had hoped to get a supercharged engine for it again....but the usual - other running cars to maintain, marriage, children etc have ment it continues to languish. It is very well built being all steel floor and body (bit like an all in one body). The edges around the cockpit are turned over a 1 inch by 1/8th inch strip steal frame and 1 X 1 angle is bent round in other places such as where sides meet inner wheel arches. Rear wings are part of main body and are double skinned . The curved tail, head faring and rear wings are achieved by strips of steel welded edge to edge to give that perfect beautiful shape. It is a very special little "special". Further info passed to me was that in the mid 60s the SC Ulster engine was swapped for Supper Accesories bits ..... presumably the usual in those days that such an exotic engine was not sustainable. Log book shows engine change April 1960 (I have original log book 1947 to date and list of original 26/7/38 George Povey; 31. 10. 40 Aircraft Components Ltd., Arle Court, Cheltenham (taken over by Brown Bros of Downes Rd London E5); 25 . 5. 46 - Purkess Ltd, Ballards Lane, Finchley, Middlesex; then 15 .7. 46 John Kirby, Wendover Court, Bourn End, Buckingham. I have the letter John wrote to me telling me as much about the car as he could remember (after 25 years) He paid £350 for it trading in a "little 2 seater sports" for which he was allowed £150 and the rest on HP. The rest of the letter has more details he could remember. He says that Oscar Moore, racing driver 1947, was owner he bought it from at the Purkess garage in Finchley.. but I have not been able to get any further with that. There is some confusion between Oscar Moore and another person Oscar Moores! Car laid up during the war til Oscar got it but he could not make it go fast enough for his racing so changed to BMW 328 (being all steel it is a bit heavier than would be expected of a 7 but John K says he had it paced by a friendly police car at 85mph on a by-pass! Those were the days!! There is a photo of John Kirby and wife in car 1948. Another photo shows a D Hutchinson at the wheel in 1948 at Three Ashes Farm....no further info on that. and another in 1958..will need to search through to find who sent that. More recently I have received photos of it when under ownership of Edwin Sidney Skingley of West Wickham Kent Oct 1950 to Apr 1957....but have not been able to get in touch with the third party person that supplied the photos via a VSCC or Austin club member. Please feel free to copy over any of the photos in my flickr account. I tried many times to trace history and managed to contact some previous owners from the 40s when it still had its proper SC engine, e.g. 1946 John Kirby, but still tantalisingly a lot missing till a very few years ago when Stuart must have been researching the engine and contacted me and put me in touch with Beatrice Canning-Brown. She of course knew George Povey, who was the first registered owner 1938 and knew his racing SC Ulster, OU 5753 which she says disappeared in around 1937?. So she supposes bits from the Ulster were used to make EOG 454. There is also mention by Beatrice that the crankcase may have come from an Ulster specially made for Kay Petre. A Kay Petre connection was mentioned from a different source all those years ago not long after I got the car. MotorSport July 1950 carries an advert by Simmons of Croydon with photo and details and they call it a works Le Mans! £285. If only we had had computers in those days to communicate easily and record info easily. I suppose a copy of the log book showing the owners may turn up some memories by someone? Must go and get on with my Nippy special now. (03-11-2017, 05:03 PM)Mike Costigan Wrote: Those of you who have nothing better to do may have noticed the Gallery button at the head of the page. I am hoping to develop this feature into a meaningful resource for everyone's benefit, and the time has come to publicise what I have done and invite anyone with suitable photos to contribute. The plan is for members to be able to upload a photo to the Test Category, and I will then vet them and transfer to the appropriate category. At the moment I would like to concentrate on 'period' images but if you have something else which you would like to share with a wider audience I am receptive to suggestions. Similarly, if you have suggestions for additional categories, or would like existing categories modifying, just let me know! Anyone got any van pictures (I realise there are a lot on Google)! Myself and others have uploaded a number of period images of A7 vans to the ASF Gallery Page. There's also some period and more recent rally images of restored vans on my seven Pinterest A7 Van boards - though photos of your particular VE model seem quite scarce. 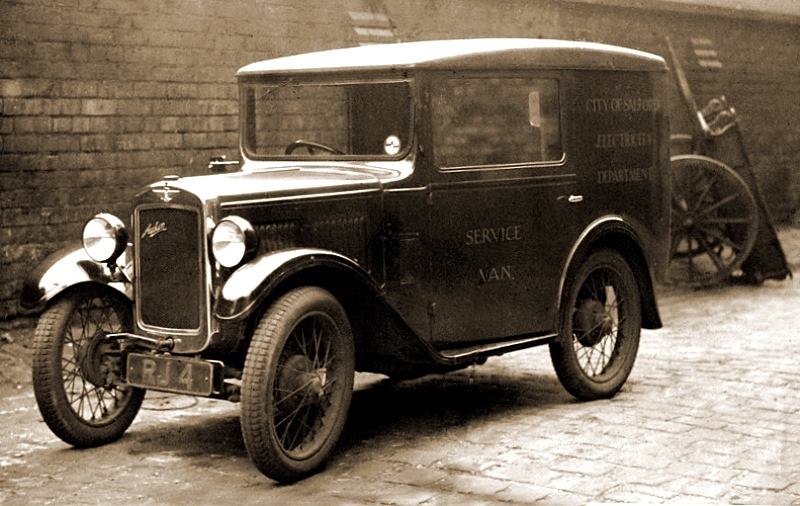 This would also appear to be an A7 VE van - first registered in Newcastle upon Tyne in mid 1931 as part of Ringtons Tea modernisation of their door to door delivery fleet replacing their iconic horse drawn vehicles - one of which can be seen in the photo. This archive image is currently featured on one of their packs of Decaf Tea Bags, hence the odd shape. looks like a deeper rad than the previous pic Mike put up? The caption is self explanatory. 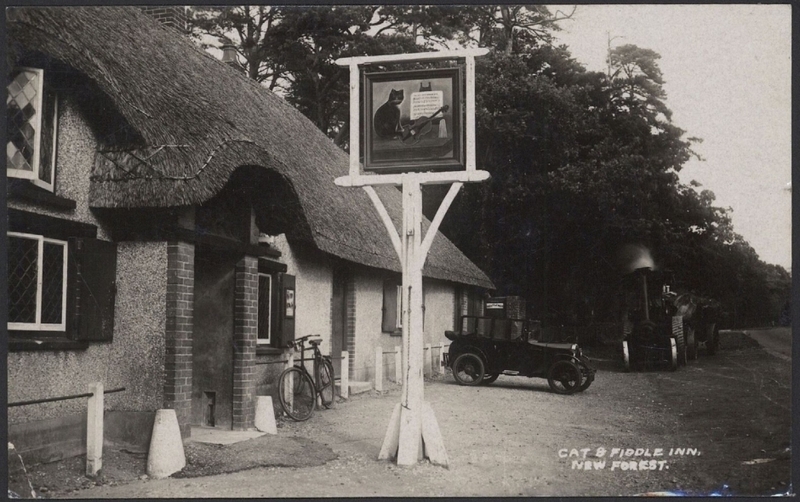 Anyone know the pub if it is still there? the steamer looks likely to be a Burrell 5 ton tractor, probably pre 1910. Hauling timber on a pole carriage, and has been banked up for the night. (03-01-2019, 01:55 PM)Hedd_Jones Wrote: The caption is self explanatory. Anyone know the pub if it is still there? A smoky, sparky, coal fire in the traction engine --- next to a thatched roof!